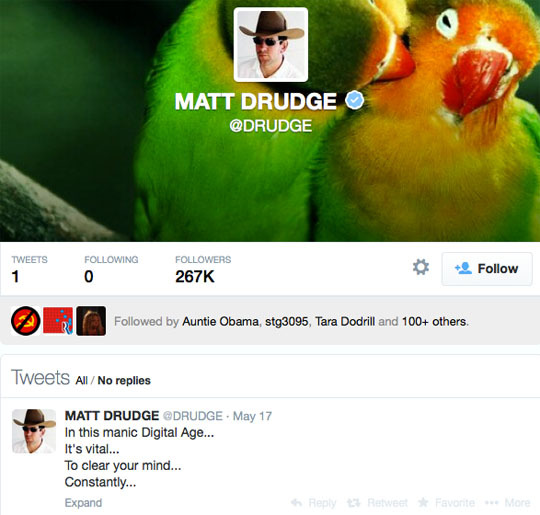 If you follow Matt Drudge on Twitter, you’ve already seen that he’s deleted all his tweets except one: “In this manic Digital Age…it’s vital…to clear your mind…constantly.” He’s right. The great thing about the internet is that more information than ever is available at the touch of a button. MIT courses are available for free online. If you need to know how to fix a hole in drywall (as I recently did) you can learn how to do it in minutes. If you want to learn about octopus camouflage, you with one quick Google search. If you want to learn about all the times much of Virginia has been under water over the course of millions of years — to the dismay of the Climate Change crowd — you can do that. The problem is that there is so much information available that sometimes it’s easy to get lost and confused if you’re not grounded and viewing it all through a principled perspective. Last year I mentioned that I began meditating. There were many reasons for that, but one was to clear my mind on a regular basis. Have you ever tried drinking from a fire hose? Probably not, but it’s obvious that it would be a rather unproductive experience. The news consumer today often finds himself trying to drink from a fire hose of information. Unscrupulous individuals know that this is what many people are doing and they use it to their advantage. Scandals — legitimate scandals — fall to the wayside because the “hose” keeps going 24 hours a day. A story that happened a day ago feels like it’s a week old. A story that happened a week ago feels a month old, and so on and so forth. On recent example would be Former National Security Council spokesman Tommy Vietor’s “dude” remarks regarding the Sept. 11, 2012 terror attack. Baier pressed Vietor on his role in changing the talking points by adding a line about the administration warning the day before the attacks of “social media reports calling for demonstrations,” in order to bolster the false idea that the attack was the spontaneous result of a riot against the video. Vietor affirmed this, but when Baier asked him if he’d changed “attacks” to “demonstrations,” he got amnesia. Vietor’s math is also off. The attack that killed four Americans took place Sept. 11, 2012, less than 20 months ago. If your mind is not clear — and if you are not principled — it becomes very easy to adopt the “dude…that was ages ago” mindset for any number of events that should occupy a more prominent place in your consciousness. In a weird way, the sheer amount of information available has turned many people into human goldfish; they only make decisions based upon the most recent twitter hashtag or newsworthy event happening…now….or now…or now…or now. Just as too little information can be detrimental to an individual, too much information can be just as deadly. You can drown in information if you don’t know what to do with it. The Sept. 11, 2001 terror attacks were a good example of having too much information coupled with the inability to process it. Roughly 3,000 Americans died on that day because there were countless “dots” within a sea of information, and the system wasn’t set up to make sense of it all. Say what you will about Matt Drudge, but he’s a very shrewd individual. There’s a reason why he’s been so influential for such a long period of time. He may be rather enigmatic, but he’s certainly worth taking seriously. “Clear your mind constantly” is advice worth taking in the digital age. Now if you’ll excuse me, I’m going to do just that. It goes without saying that a lot of people today have warped priorities. They dismiss Benghazi, the IRS and other Obama administration scandals as “phony” because Fearless Leader says so, but get upset over non-existent “micro-aggressions,” are obsessed with other people’s money and bring attention to things like the Boko Haram thugs kidnapping young girls in Nigeria not because they legitimately care about getting the girls back, but because they want attention for themselves. And so on. Tommy Vietor is an embarrassment. He’s a young punk who never matured past middle school. I’m 24 and I think I’m more mature than he is. Carl, you were probably more mature than Vietor when you were in first grade. He sounds more like a student at Ridgemont High than a government spokesman. He should be living in a loft over his parents’ garage and playing drums in a Doors cover band. Come to think of it, so should Fearless Leader. LOL. The Ridgemont High comment made me laugh out loud. He’s probably one of Spicoli’s buddies, all grown up. Ironically, that’s the only Sean Penn movie I actually like and it’s largely because of Phoebe Cates. Side note: I guess I was always a little mature for my age. For example, I learned how to read at age two or three, if memory serves. I started reading sci-fi and fantasy at a young age, stuff that was considered to be way above my age group’s reading level. I read a lot of non-fiction as well. As you can imagine, it was always a bit disheartening when I’d read books about ancient history or World War II or some great fantasy book over break and then come back to school where I’d have to read boks about tying your shoes or about Little Bear learning how to use the toilet for the first time. Actually, it was Miss Piggy, not Little Bear, but the point still stands. That book, I recall, was in my first grade classroom. First grade, of all places…. it was something better-suited for preschool. Clearing my mind… wish meditating or yoga worked me like it does for you Doug. However, do you think that, possibly, writing might be able to help me? Emmanuel, I am not inside your head. You — and only you — can figure out what makes you happy, at peace, etc. I have tried my best to strike a balance between being empathetic to your problem while also not allowing posts to turn into conversations that are all about you. I have linked to videos. I have shared the best advice I can, given my limited knowledge of your situation. But ultimately (and I believe Patrick said this as well) it all comes down to you. Don’t ask a guy like me what “might” make you happy — dig deep down into your own soul and find out what you need to do. What you do is ultimately up to you, Emmanuel. You are in control of yourself. No one else. Only you knows what makes you happy.